Last fall, I joined a quilt guild. I never imagined it would be so much fun and inspiring. We have exchanged names for "secret quilters" and pictured to the right is the gift I received tonight. 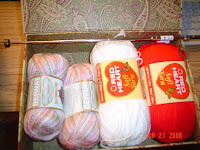 The person obviously knows I like to knit! The silver rod at the top end of the yarn is a magnetic pin catcher, so I won't need to do much bending to pick up any pins I drop! Our guild meets monthly. We have a short business meeting, have show and tell for any projects we have worked on, enjoy a program that changes each month, then enjoy "lunch" or a snack prepared by a couple of members. We also have drawings for a "fat quarter" bag, door prizes, and some times other neat stuff. Tonight, two ladies received $25 gift certificates for making "hug" quilts. We were challenged to bring a "hug" quilt next month. "Hug" quilts are quilts we make to donate to whomever needs them. Last year, our guild donated 87 "hug" quilts!